One of the bodies is certainly in 2.H.13. – this casualty was recovered from 401655 in February 1946 and appears to be a very good match with the body described in the enquirer’s last paragraph. Map Ref. 401656 in June 1945 and is now buried in 4.A.21. Map Ref. 400654 in June 1945 and is now buried in 4.A.22. 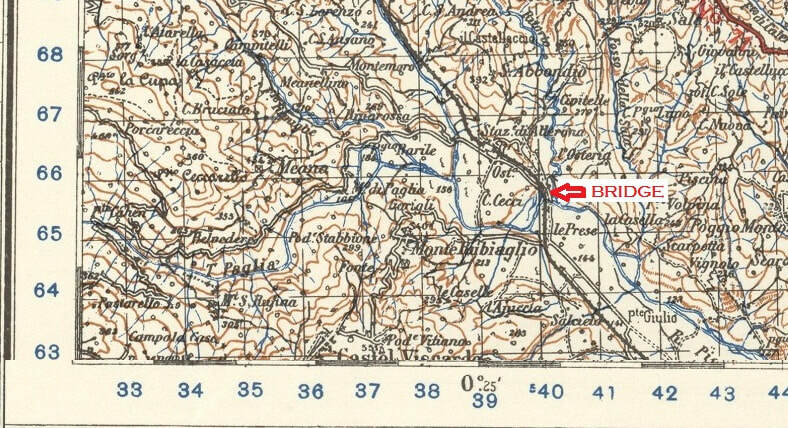 6 bodies were recovered from the site of Paglia Viaduct (Map Ref. 402654) in October 1944 are were reburied in graves 4.A.15 to 20. A further 3 bodies appear to be connected with this incident as they are recorded as being ‘POW casualties removed from the river after train blew up’ who were buried it appears soon after the incident in Orvieto Public Cemetery. They are now buried in 1.B.5., 1.E.4. and 1.H.22. How many men were on the train? The estimates given by the survivors as to the number of men on the train vary considerably. Four of the men interviewed by the British commission set up to investigate the bombing, the results of which are contained in WO163/668, National Archives, London, were 10601299 Trooper G. A. Gibson, 3253567 Rifleman J. L. Leeson, 2932159 Signalman E. S. Sutherland and 6472466 Fusilier J. Willis. 10601299 Trooper Gibson said he thought there were 1200 men on the train, the entire contingent being held at Camp 54, Fara in Sabina. Rifleman J. L. Leeson made reference to 1000 men whilst Signalman E. S. Sutherland believed there to have been between 800-900. Fusilier Willis estimated there to have been 500 British, between 200-300 Americans, 20 New Zealanders and 220 South Africans of whom 200 were black and 20 white. The fact remains that of these men only 105 would appear to have been remembered in cemeteries or on memorials, it having been possible to identify and name them. The men known to have been on the train but whose bodies have never been found are remembered at Cassino or El Alamein, on the memorial nearest to where they are last known to have been in combat. 176 American, British or Commonwealth servicemen are known to have been recaptured or taken from the two hospitals at Acquapendente and Orvieto and sent to prisoner of war camps in German-controlled territories. A further man was admitted to hospital in Orvieto and later sent to the civil hospital in Mantua along with other prisoners who were not fit to travel beyond the Italian frontier, five of whom died and are buried in Padua War Cemetery and have been included above. Two of the wounded are known to have died as prisoners of war, one in France and one, who was Jewish, in Austria. Eight South Africans were admitted to hospital in Orvieto but do not appear on the lists of men sent to POW camps in Germany or German-occupied territories, neither do they appear in the cemeteries or on the War Memorials, and a further seven men of other nationalities who were admitted to hospital cannot be accounted for. Six injured men were repatriated in the autumn of 1944 after the Allies had liberated Central Italy. Thirty-five named men and two unnamed New Zealanders appear to have reached Allied lines. Fourteen known escapees were recaptured, though four of them escaped again. Eight American escapers were shot by the Germans at Montebuono Sabina on 13 April 1944. It is believed that all the men in the following list had spent some time in Camp PG 54, even if only one or two nights - and most of the soldiers captured in Italy had passed through the transit camp at Frosinone. 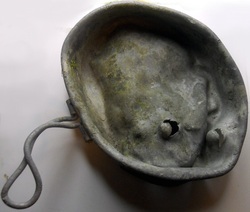 The men from the 'Saracen' had previously been in Camp no.1 Marina at Manziana, Lake Bracciano whereas many of the Native South Africans had been held in P.G. 122, Cinecittà, Rome before beimg transferred to PG 54. Martin FW 6351452 Corporal 2 Parachute Regiment, A.A.G. Blewitt William 7895023 Pte 1 Battalion Sherwood Foresters (201 Guards Brigade) Captured Near Gazala Western Desert Recaptured along with Tprs R W Calvey and G. A. Gibson on 04/02/1944 Sent to Camp 82 Laterina Escaped again with Gibson. Roberts Leonard C D/JX.143367 Petty Officer The Saracen Submarine Corps Captured off the coast of Bastia Corsica 14/08/43 Sent to Marlag und Milag Nord where he was imprisoned from April 1944 until April 1945 when he was force-marched to Lubeck. Freer George A C/KX.99634 Stoker The Saracen Submarine Corps Captured off the coast of Bastia Corsica 14/08/43. Sent to Camp no. 1 Manziana, escaped 9 September following Italian Armistice, recaptured to the south of Sora at Oliveto, sent to Frosinone, thence to Fara in Sabina, Moosburg and finally Marlag un Milag Nord until liberated. Doherty Terence 14214431 Pte 6 Lincolnshire Regiment Captured 21/12/43 Garigliano. Uninjured. Recaptured 30 March at Rieti and held in town gaol before being sent to Stalag VIIA Moosburg. Recorded in National Archives WO361/668 as having been on train. Captured with him was O-800669 James H. Spiro USAAF, shot down near Viterbo on 29 February, who was sent on to Stalag Luft III. Emery Norman 3781397 Lincolnshire Regiment. Recaptured 30 March at Rieti with T. Doherty and held in town gaol before being sent to Stalag VIIA Moosburg. Harston Cyril S.C. 4037932 Lincolnshire Regiment. Recaptured 30 March at Rieti with T. Doherty and held in town gaol before being sent to Stalag VIIA Moosburg. Jackson Granville Rank and regiment unknown Uninjured Picked up 7 February by the Feldgendarmerie (German military police) Held in Perugia gaol until 10 February. William was a young baker from Coupar Angus in Perthshire when he originally signed up with the Army Service Corps in January 1915. He was almost immediately sent to France and Flanders with the 51st Field Bakery and then transferred to the 2nd / 14th London Scottish Regiment which, later in the War, was based in Salonika and Egypt. Now married with six children and living in Comrie, a small village in the Scottish Highlands, he signed up for the Royal Army Service Corps again, aged 43, in January 1940. He rose from Private to Sergeant before being taken POW at Tobruk. The part of the record which says Captured Tobruk is barely leggible. However, the date at the side - 20 06 42 - can be read easily. 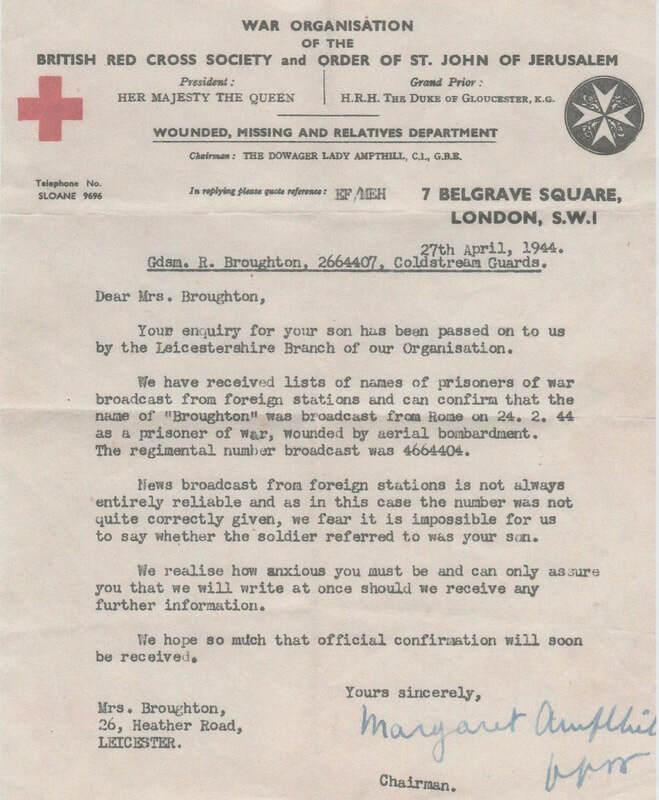 On the second sheet it is possible to make out the words 'presumed killed in action whilst prisoner of war ' and the date, 28.1.44. The above N.C.O. was known to me whilst in Camp 54 until September 1943. I next saw him in the same camp after we had both been recaptured by the Germans in January 1944 and I spoke to him at frequent intervals. I also saw Sgt. Anderson on the train at Fara Sabina station after we had been embarked for transportation to Germany. The car in which Sgt. Anderson was travelling was roughly in the centre of the train, my own car being further to the rear. Thus it appears that the car in which the above N.C.O. was travelling was among those which were apparently hit by the subsequent bombing of the train at Orvieto on Jan 28. I have not since met anyone who can substantiate this belief. 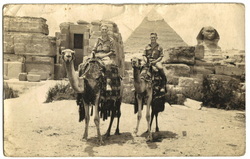 On leave in Egypt before being captured at Tobruk. After being held in a POW camp at Bari he was transferred to Fara in Sabina, where the photograph shown underneath is believed to have been taken. I met Vere for the first time since leaving Umbogintwini in a place called El Adem...Uniquely, our battery had been issued gin that week. After a couple of mugs of this and murky well water, and a fair amount of reminiscences, Vere moved off from our site towards dusk. Looking back, if Jimmy Culverwell had not carried a knife, the train would have passed through Orvieto before the bombing attack took place. Vere and the rest of us would have gone through to Germany, and returned home after that country's collapse. How overjoyed Vere would have been to return to his family, his mum especially. She was, I can remember from boyhood days, a most sweet-natured lady and a gentle mother. 4975608 Private Robert Crofts of 1 Battalion Sherwood Foresters was born on 30 August 1918 in Beighton, then part of Derbyshire but now in Sheffield, the fourth child of miner Robert Crofts and his wife Blanche Warren who had married in the Sheffield district in 1913. The family moved to the Rotherham area sometime between 1925 and 1931. Robert's father died in 1934 and his mother married Thomas Doyle in 1935. 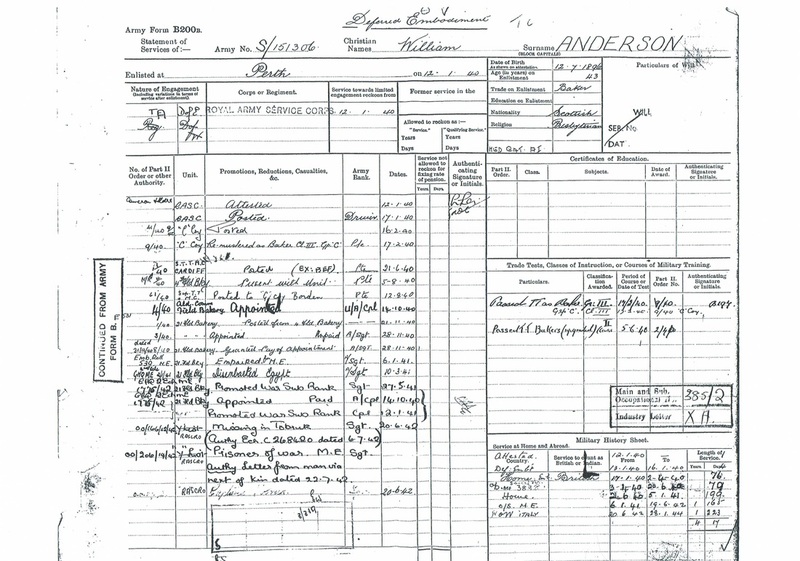 In January 1944 the family was living at 50 Nelson St, Maltby. Private Crofts was captured during the Desert Campaign in June 1942. 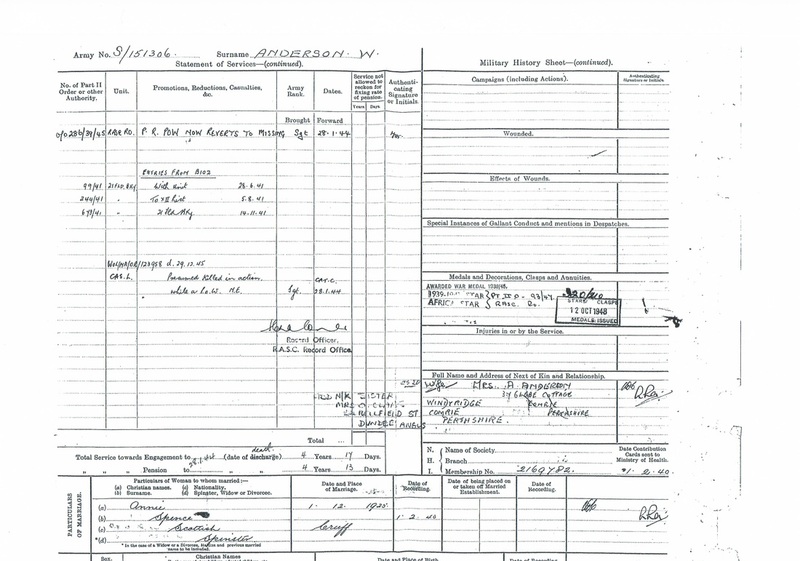 He was transported to Italy and held in POW Camp 66 at Capua before being transferred to POW Camp PG 54 at Fara in Sabina. Seriously injured in the bombing of the bridge at Allerona, his mother's name and address was one of only four which the priest don Miscetti of Monterubiaglio was able to collect before he was stopped at gunpoint by the Germans. Admitted intially to Orvieto hospital suffering from broken ribs and emphysema, on 7 February he was transferred by hospital train to Mantua hospital where he died on 23rd of the month. He is buried in Padua War Cemetery. Robert's brother John, Michael's grandfather, was taken prisoner by the Japanese and put to work on the rail line just down from the bridge over the River Kwai. Fusilier John Kean was taken prisoner on 17 January on the Garigliano. He escaped from the train and was not recaptured. After having been looked after by a local farming family for a while he set off on his own to reach the Allied Lines and was successful, crossing some snow-covered mountains in the process. On 17 September 1944 in Leeds he testified to the fact that Fusilier John Wright and Corporal Sidney Couzens had boarded the train with him and were uninjured at the time. (WO 361/668) They are among the dead. Guardsman Robert Harold Broughton was mortally injured and taken to Orvieto Civil Hospital, where he died. He was buried in Orvieto Civil Cemetery and transferred from there to BOLSENA WAR CEMETERY on 25 April 1945. ​47441156 Private Harston Francis Horace 6 York and Lancaster Regiment. It would appear that this letter, and presumably others sent out to the families whose relative had died in hospital in Orvieto, represented the first occasion on which the bombing of the bridge was referred to.